This is an excerpt from a book called The Sparrow, by Mary Doria Russell, which I read a few years ago. I didn’t love the book, but it has some very memorable passages that are worth reading the book for. Bits and pieces of it come up for me every now and then. 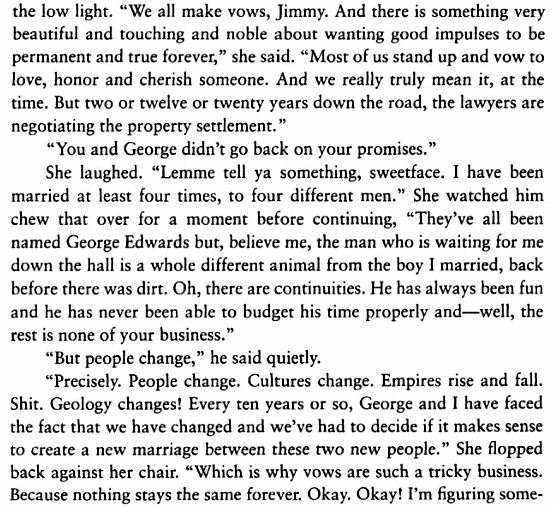 In this passage, one of the main characters talks about how she’s been “married four times, to at least four different men”—all of whom were the same man, strictly speaking. The idea is that over a lifetime, people change in pretty drastic and unpredictable ways, to the point where every now and then you look back and realize, we’re not the same people we were five, ten, twenty… however many years ago. In my own relationships, and in the other long-term relationships where I’ve had the privilege of viewing some of the inner workings, it seems pretty normal for there to come a time when the two new people you’ve become over the years stand there looking at each other and have to ask, “whatever we may have believed or wanted a few years ago, do these two people belong in a relationship NOW?” Someone once described this as having the relationship stripped down to its core, discovering what’s there without knowing if there would still be a core to build back up from. Sometimes the answer is yes: these two new people still want to be together. And then you move forward, perhaps with a stronger relationship than before. But sometimes the answer is no, it doesn’t make sense anymore. I think this is normal and okay, and yet somehow we always seem blindsided by those events, and angry, and treat them pretty universally in our society as though they shouldn’t happen. In fact, people seem to see them as a betrayal (think “I don’t even know you anymore!”) As though people we’re committed to growing and changing in ways that are different from ourselves should somehow not be allowed, or means they love us less.